You've carefully saved them year after year. As they accumulated, every now and then you looked them over trying to remember some of the activities of the special day. For some time you hesitated to find a reason to put them on for fear you would eventually wash away the family reunion logo and slogan and fade both the art and the memory of that moment in time. So back into the dresser drawer, storage bin or closet they go. Now there is a reason, a very important and meaningful reason, to take your family reunion t-shirts out of the closet and bins and put them back in circulation. And just what could this good reason possible be? It's time to make a family reunion quilt? Not just any quilt. A family reunion t-shirt quilt. 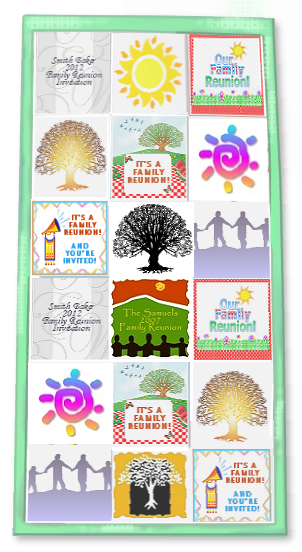 Like other family reunion quilts, this quilting project will bring the family together like no other. It will speak of years of reunions and thus serve as a historic monument, a keepsake and heirloom. So how do we get started? You'll need several family reunion t-shirts, a block grid, 9 block patches, scissors, light colored pencil, a hand sewing kit with pins, a ruler and coordinated block patches. For extra quilt blocks rry Jo-Ann Fabric and Crafts quilt block patches, iron ons & appliques as well as quilting kit supplies and materials. Your family reunion t-shirts are the main feature of your quilt. That said, choose shirts that are in good condition, less faded and the material is in good condition. Avoid using shirts with small holes, torn threads or worn. The basic nine patch quilt block pattern is the base for your quilt. In order to enlarge or reduce any block pattern you need to create a grid. Determine the number of blocks in the grid. For example a 9 patch quilt has 9 blocks of equal size. An 18 patch quilt has 18 blocks of the same size. Make your block grid accordingly. Having made the grid look over the patterns of your t-shirts and determine the most uniform or meaningful placement. You may wish to place them in chronological order. Perhaps the color pattern will be your guide. Or the themes will determine the order. To determine the number of inches for each square look over the t-shirts you will be using. Find the shirt with the widest printed graphics. Using a ruler measure the edge of the graphic end to end length and height. Now add two to 4 extra inches to the length and height of the quilts back to serve as a border along the edges. You want your quilt patch blocks to be cut so that they are placed symetrical. Each will need to be the exact same size whether you're making a quilt that's nine squares or 18. Your t-shirt block pattern should measure 8x8 or 10x10 or 12x12, etc. Cut a piece of poster board into a pefect square using the measurements determine. This will be your standard block pattern to be used when cutting the block patches from each t-shirt. Carefully place the standard block pattern on the shirt so that the logo and slogan is centered vertically and horizontally. Trace around the edge of the block pattern using a light colored pencil. Now using your scissors cut out the patch. Make certain the scissors are sharp so as not to pull and tear the threads of the shirt. If you only have a few t-shirts consider adding coordinated block patches. Try this using Jo-Ann Fabric and Crafts quilt block patches, iron ons & appliques, as well as quilting kits. Next measure material the full size of your quilt adding 4 inches to the pattern. The will be the quilts back and frame. The additional inches are to half-fold over the edge of the quilt. Now using sewing pins attach each patch, seam to seam, until the 9 blocks are prepared for sewing. After pinning the seams between your patches lay them over the quilt backing material face up and perfectly centered. Commence sewing along the seams of all the patches thru the back material. You can do this by hand or using a sewing machine. Half-fold the quilts back material over the edge of the sewn patches and create a small seam. Sew along the seams edge. In no time your t-shirt quilt is complete and ready for display. What memories this quilt will trigger as you enjoy a new family heirloom to last for generations.